"That's really hot, can I have some more?" & "Please pass the shaker." These are just two of the often heard phrases after someone enjoys a shake or two from The 'Original' Habanero Shaker! "Yes, these are the peppers you've heard about!" So, what is it about the Habanero chile that has everyone talkin' and shakin'? First, the Habanero is arguably the most flavorful pepper of all. It's downright tasty!! Smoky, buttery... You're going to LOVE the flavor! In addition, the Habanero along with its various cousins and often used slang terms, are among the HOTTEST chile peppers in the world. Are there hotter peppers on the market today vs. when the 'Original' Habanero Shaker first was introduced? Yes there are. However, when comparing flavor and amount of heat, we continue to feel The 'Original' Habanero Shaker has 'the perfect' combination of both! Super hot, (but not so hot they're unbearable) combined with a flavor that can't be beat! Yeah baby! According to the Scoville heat scale developed in 1912 by a pharmacologist of the same name, Habanero's average 200,000 Scoville units of heat compared with an average of 4,000 units in a Jalapeno. The heat comes from the capsaicin molecule produced in the placental ridges, not the seeds as often thought. Habanero's belong to the Chinense (not Chinese) species of peppers, and as a group, contain some of the highest amounts of capsaicin. As a side benefit, capsaicin triggers your brain to produce and release a nice 'dose' of endorphins, the body's natural painkiller. These endorphins are the same ones that are released during a 'Runners High', and are similar to an opiate molecule. They lock onto certain receptor sites in the brain causing a calming, soothing sensation! Don't worry though, chile peppers do a body good! "They lock onto certain receptor sites in the brain causing a calming, soothing sensation!" The Habanero claims many health and medical benefits backed up by years of research. One such study by scientists at L.W.U. medical center concluded that capsaicin can kill many types of bacteria. Test tubes were filled with harmful oyster bacteria, as well as E. Coli, Shigella and Salmonella. Ketchup added to the test tubes had no effect. Lemon juice and horseradish killed some of the bacteria. Hot sauce though, killed ALL bacteria in 1 minute flat. Even diluted 16 - 1 the sauce killed all bacteria in 5 minutes! Researchers at Texas A&M also found that capsaicin increases your body's metabolic rate, suggesting a 'possible' aid in weight loss. Capsaicin also causes your blood circulation to increase on contact. Many researchers say also that capsaicin is suspected to mildly irritate the stomach lining arousing substances called prostaglandins that produce a protective barrier actually soothing and preventing ulcers. Habanero's are also packed with vitamin 'A' and 'C', as well as other vitamins. 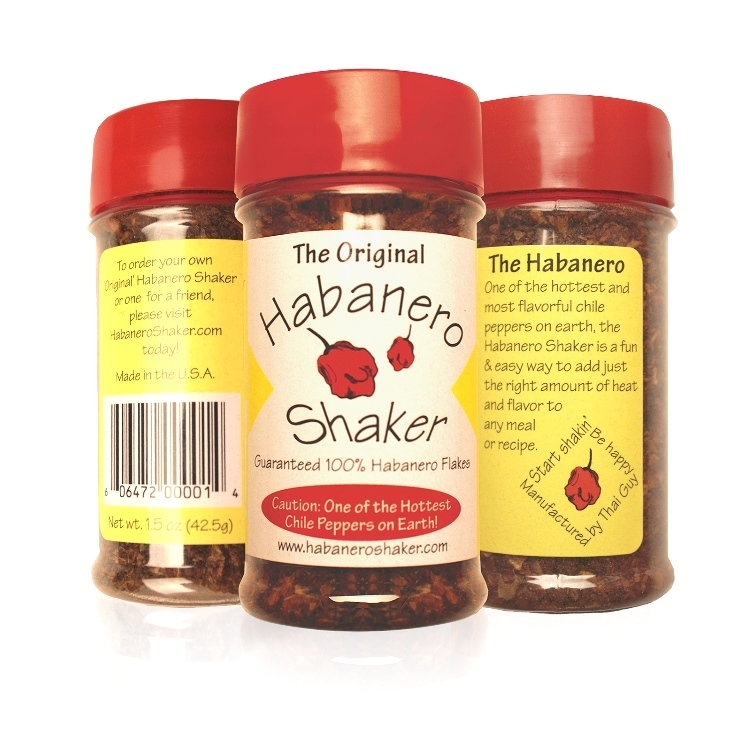 Keeping your 'Original' Habanero Shaker for long periods of time will have no effect on potency. Capsaicin is an incredibly powerful and stable alkaloid. It is unaffected by cold or heat, retaining its original potency despite time, cooking or freezing! So start shakin' and be happy! To Order Your Shakers Today! Makes a GREAT Gift for the 'Hot Lovers' in Your Life! lunch & dinner... Heck, shake on EVERYTHING!! Love these flakes. Right amount of heat and can adjust it to my level. - Ranisha, N.C. Please Join the Discussion and 'LIKE' Our Page on Facebook!